It is very rare for us to go for a trip that does not give an opportunity to self-collect and visit mineralogical localities … but from time to time it happens. Last year we decided to visit Cappadocia once again (you can read about our first trip here). We had just a few free days and we really loved the beauty and incredible geology of that place so we (Tom, Tom`s mother – Ania and I) set off to Turkey. First we flew to Istanbul – the largest urban agglomeration in Europe and a city located on two continents. We spent the evening and the next day on sightseeing. We flew from Warsaw to Istanbul. Istanbul by night. J. Praszkier photo. Shop with typical Turkish sweets - most of them are really really sweet. J. Praszkier photo. Hagia Sophia by night. J. Praszkier photo. Sultan Ahmed Mosque by night. J. Praszkier photo. Fishing is very popular in Istanbul - even at 2 AM. J. Praszkier photo. Next day we had to get up early as we had only one day to see all the most important monuments in Istanbul. J. Praszkier photo. View to Hagia Sophia from a restaurant`s terrace. J. Praszkier photo. Hagia Sophia. J. Praszkier photo. Hagia Sophia was constructed in 537 and it served as an Eastern Orthodox cathedral till 1453. 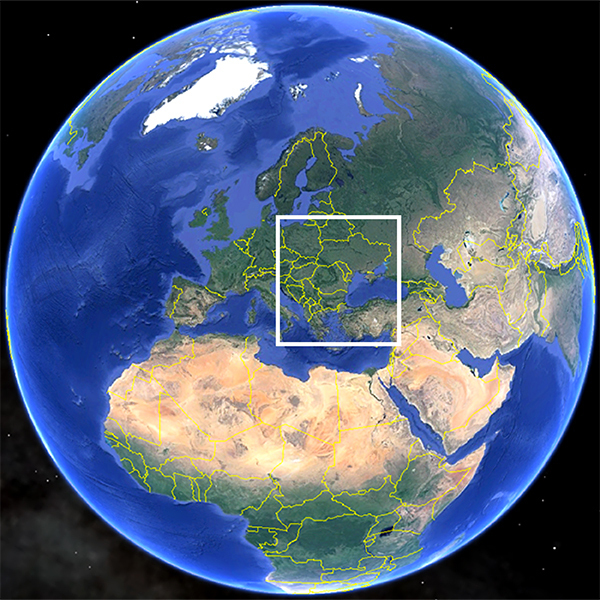 From the date of its construction in 537 until 1453, it served as an Eastern Orthodox cathedral with a 57 years break (1204-1261) when it was converted to a Roman Catholic cathedral under the Latin Empire - a feudal Crusader state founded by the leaders of the Fourth Crusade. From 1453 until 1931 the building served as mosque, and in 1935 it was then secularized and opened as a museum. When in 1453 the city was conquered by the Turks Hagia Sophia was turned into a mosque - all the symbols and relics of Christianity as well as mosaics depicting human figures were removed (it is forbidden in Islam to create the images of living beings - especially Gods) and replaced by Islamic features including minarets that were added to the construction. Hagia Sophia is famous especially because of its massive dome. It is considered the epitome of Byzantine architecture and for almost 1000 years it was the largest cathedral on Earth. Hagia Sophia is currently (2014) the second-most visited museum in Turkey. A large number of mosaics were uncovered in the 1930s. Because of Hagia Sophia`s long history as both a church and a mosque its restoration is not easy. In the recent years it brought on the discussion if the original Christian mosaics should be uncovered at the expense of important and also historic Islamic art, for example it is very controversial if the Islamic calligraphy on the dome should be destroyed in order to restore underlying Pantocrator mosaic of Christ as Master of the World, to be exhibited especially that it is no sure that the mosaic still exists. Southwestern entrance mosaic depicting Virgin Mary, Christ, emperor Constantine, emperor Justinian I. J. Praszkier photo. Imperial Gate mosaics. J. Gajowniczek photo. The dome of Hagia Sophia. J. Praszkier photo. Inside Hagia Sophia. J. Praszkier photo. An exhibition of calligraphy in Hagia Sophia. J. Praszkier photo. Sultan Ahmed Mosque popularly known as Blue Mosque, it is still used as a Mosque but tourist can visit and admire its beautiful colorful ornaments that cover its inner walls. J. Praszkier photo. Sultan Ahmed Mosque. J. Praszkier photo. Inside the Sultan Ahmed Mosque. J. Praszkier photo. View to the Sultan Ahmed Mosque from the restaurant`s terrace. J. Praszkier photo. The Basilica Cistern was constructed in 6th century and it is the largest of several hundred ancient cisterns that lie beneath Istanbul. It is capable of holding 100,000 tons of water. This underground chamber is supported by 336 columns and its walls are 4 m thick. J. Praszkier photo. The Basilica Cistern. J. Praszkier photo. So called Hen`s Eye column, Basilica Cistern. J. Praszkier photo. The majority of the columns in the cistern have been probably recycled from the ruins of older buildings - Medusa column. J. Praszkier photo. The Grand Bazaar in Istanbul is one of the largest and oldest covered markets in the world, with 61 covered streets and over 3,000 shops. Its construction started in 1455, you can buy there literally everything. J. Praszkier photo. After speedy sightseeing in Istanbul we flew to Kayseri. 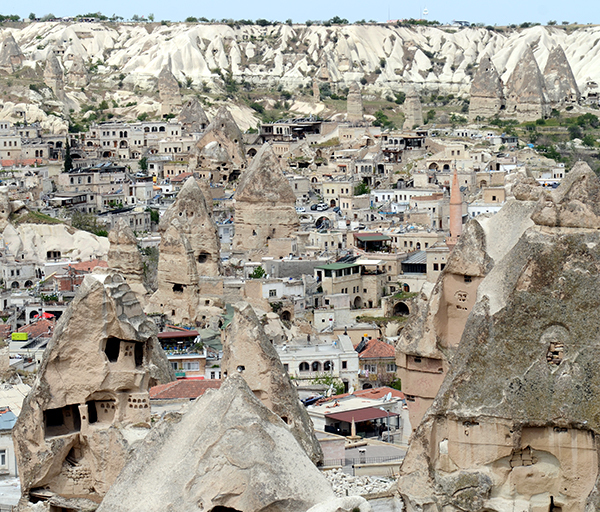 Our next goal was Goreme – town located in the heart of Cappadocia, we flew to Kayseri and rent a car there. In the eveing we found ourselves in Goreme - little charming town with incredible rock formations scattered between buildings and numerous hotels (many of which are carved in rocks). 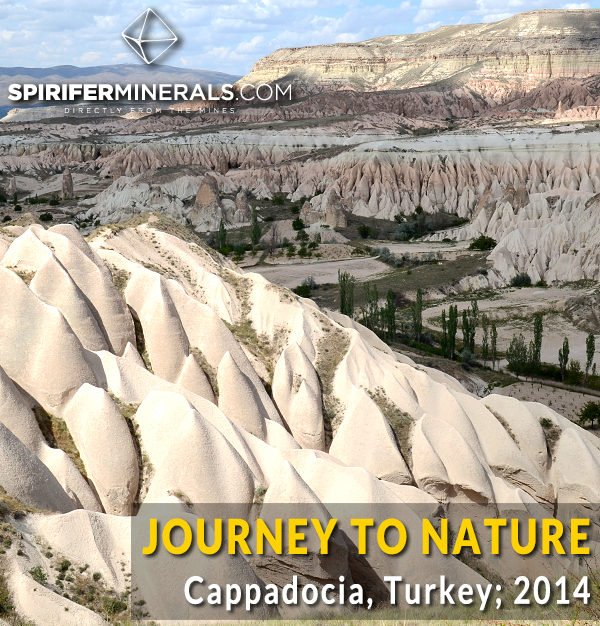 The fabulous geological formations of Cappadocia are the result of an intense tectonic and volcanic activity. 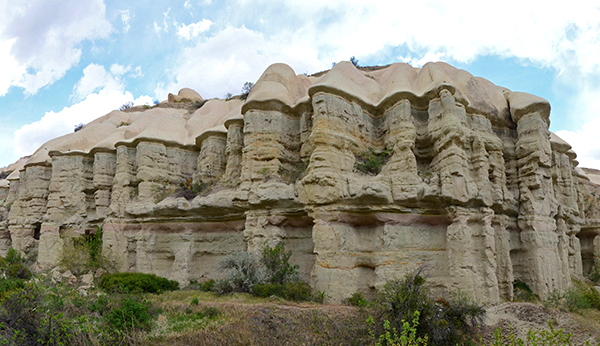 During the Alpine orogeny deep fissures and large depressed areas were created in the region of today’s Cappadocia. The fracturing process allowed the subsurface magma to find its way to the surface where it formed the Erciyes, Develi, Melendiz, Kegiboydoran, and Hasan Dag cones - a chain of volcanoes that provided the volcanic material that slowly run towards the depressed areas and covered the previously formed hills and valleys. This geological activity changed the general landscape of the region, giving it the appearance of a plateau and later covering it with tuffs (type of rock consisting of consolidated volcanic ash). Because tuff is a very soft type of rock it easily underwent erosion thanks to rain, wind and other factors creating incredible formations known as fairy chimneys. The most interesting area of Cappadocia is pictured above. The heart of the region is Goreme. We tried to see as much as we could during our short stay. Our hotel carved in rocks (as many other hotels and restaurants in the region). J. Praszkier photo. Our room, note the original tuff walls. J. Praszkier photo. 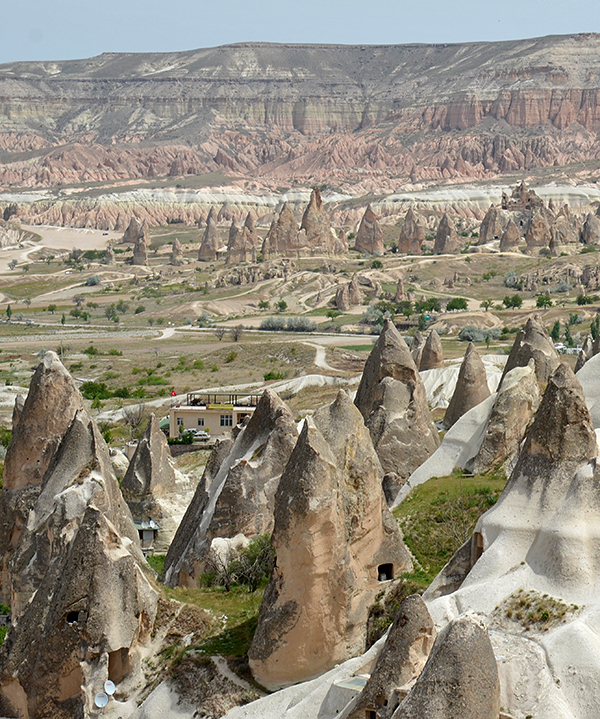 In the morning we ate breakfast with the veiw to Goreme with its fairy chimneys. J. Praszkier photo. Our hotel with baloons above. J. Praszkier photo. Baloon tours are very popular in Cappadocia. Every morning there are thousands of hot air baloons taking off. J. Praszkier photo. Baloon tours are very popular in Cappadocia. Every morning there are thousands of hot air baloons taking off. Uchisar in the background. J. Praszkier photo. View to Goreme. Many hotels and restaurants are partly carved in the rocks. J. Praszkier photo. Landscape from a view point in Goreme. J. Praszkier photo. After a quick walk in Goreme, we set off to Uchisar town. View on the way to Uchisar. J. Praszkier photo. On the way to Uchisar, the blue decoration is so called nazar - an eye-shaped amulet believed to protect against the evil eye curse. It is a very popular symbol often found in Turkish art and jewellery. J. Praszkier photo. On the way to Uchisar. J. Praszkier photo. View to Uchisar. J. Praszkier photo. Tom and I with the Uchisar in the background. A. Praszkier photo. Uchisar is situated at the highest point in Cappadocia, the Uchisar Castle, carved in the rock, towers above the town. Many rooms hollowed out into the rock are connected to each other with stairs, tunnels and passages. The castle used to be the main point of defence for the Cappadocia region. J. Praszkier photo. Snacks sold in front of Uchisar Castle. J. Praszkier photo. The interior of the castle does not look very posh. J. Praszkier photo. View from the top of the castle. T. Praszkier photo. In Uchisar town. J. Praszkier photo. 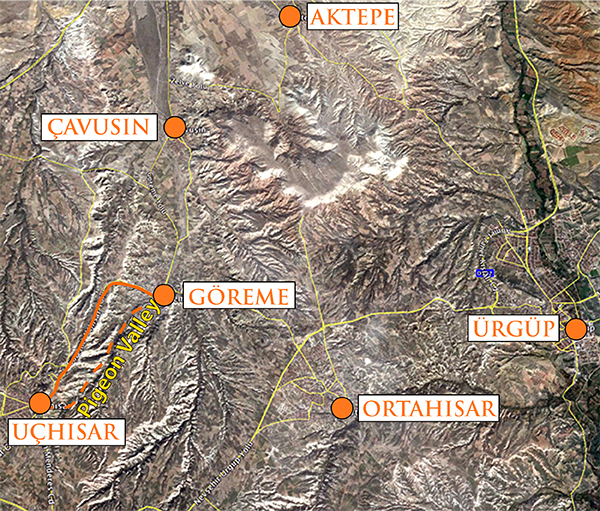 From Uchisar we went down to Goreme through the Pigeon Valley. View from Uchisar castle to Pigeon Valley and Goreme. J. Praszkier photo. Pigeon Valley with its fairy rock formations. J. Praszkier photo. In the evening we got back to Goreme and admired the town by night from a restaurant`s terrace. Evinenig in Goreme. J. Praszkier photo. Goreme by night. Minaret in the foreground. Many mosques are illuminated in green colour, as it is considered the traditional color of Islam. The Arabic word for "greenness" is mentioned several times in the Quran describing the state of the inhabitants of paradais. J. Praszkier photo. Cappadocia is considered to be one of the cradles of Christianity - its hidden valleyss became a religious refuge during the early days of Christianity. By the fourth century Christians fleeing Rome’s persecution had arrived in some numbers and established monastic communities here. The monks excavated extensive dwellings and monasteries in the soft rocks. In the first sanctuaries the ornaments were held to a minimum, in the later times the carved churches were richly decorated with colorful frescoes. When the Cappadocians were expelled from Turkey in 1923 in the Population exchange between Greece and Turkey the churches were abandoned. Now many of the half-devastated and collapsed churches are found in the valleys with no protection against misbehaving turists. It is quite sad to see those 10th century monuments in such condiion. Fortunately the most important of them are protected as UNESCO Heritage Site. We started the next day by wisiting Göreme Open-Air Museum - one of Turkey`s Unesco World Heritage Sites. It is vast monastic complex carved in rocks and decorated with frescoes. Most of the churches in Goreme Open Air Museum belong to the 10th, 11th and 12th centuries. J. Praszkier photo. Göreme Open-Air Museum - monastic complex carved in rocks in the beginning of the second millenium. J. Praszkier photo. Göreme Open-Air Museum - monastic complex carved in rocks in the beginning of the second millenium. We were caught there by a heavy rain that looked really fairy-tale-like in this scenery. J. Praszkier photo. Göreme Open-Air Museum - monastic complex carved in rocks in the beginning of the second millenium. The style of frescoes varies depending on the time of their creation - the older - the simplier and less colorful they are. J. Praszkier photo. Inside of one of the older churches in the museum. J. Praszkier photo. The style of frescoes varies depending on the time of their creation - the older - the simplier and less colorful they are. J. Praszkier photo. Tom and his mother Anna sitting by a stone dining table, Göreme Open-Air Museum. J. Praszkier photo. One of the churches, Göreme Open-Air Museum. J. Praszkier photo. Fresco of Christ Pantocrator in Dark Church. After the Turkish invasion it was used as a pigeon house until the 1950s. After 14 years of scraping pigeon droppings off the walls, its 11th-century frescoes, depicting scenes from the New Testament, are the best preserved in all of Cappadocia. What is interesting almost all faces of the painted figures in the lower parts of the walls are scratched out - it is not allowed in Islam to present faces of people, ecpacially saints and god (in contrary to Christianity). J. Praszkier photo. Church near Göreme Open-Air Museum. J. Praszkier photo. Tunnels in the church. J. Praszkier photo. Amazing rock formations!!! It is even more amazing that they build and construct in these formations!! Thanks for sharing these photos. Might have to put this place on my bucket list.